Small, Medium, or Large? Listed or Landed? 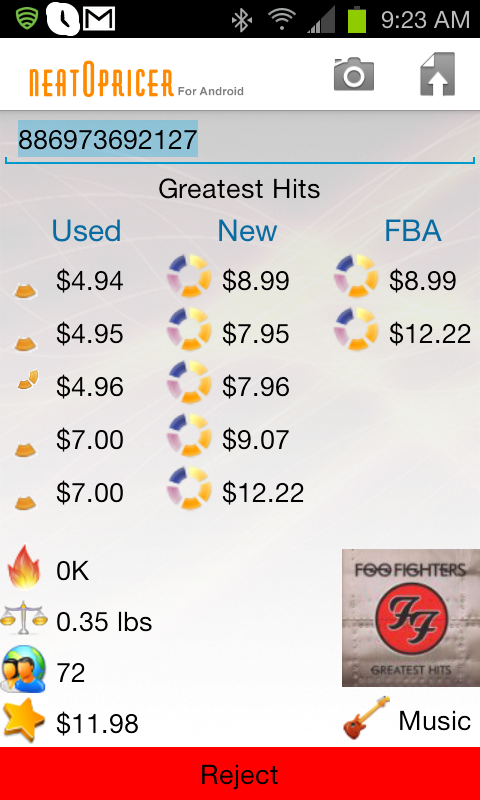 Listed displays database results with item price only. So, a 0.01 book would show up as 0.01. However, Landed causes the database results to return item price + amazon shipping credit. So, a 0.01 book would display as 4.00 because 0.01 + 3.99 = 4.00. We recommend sticking with Listed. To change your database type, you can do this on Windows Mobile Version by opening our software and changing the dropdown box on the "Account" tab. 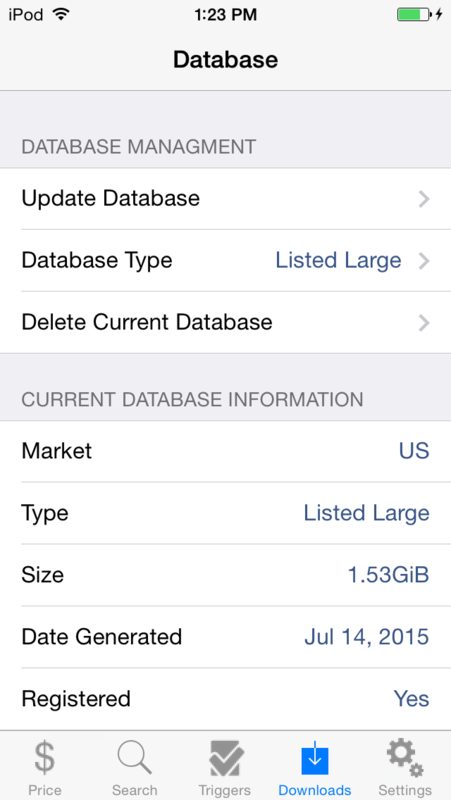 On the iOS version, it is located under "Downloads" section, titled Database Type. On the Android version, it is located under the settings menu which can be brought up by hitting your menu key. 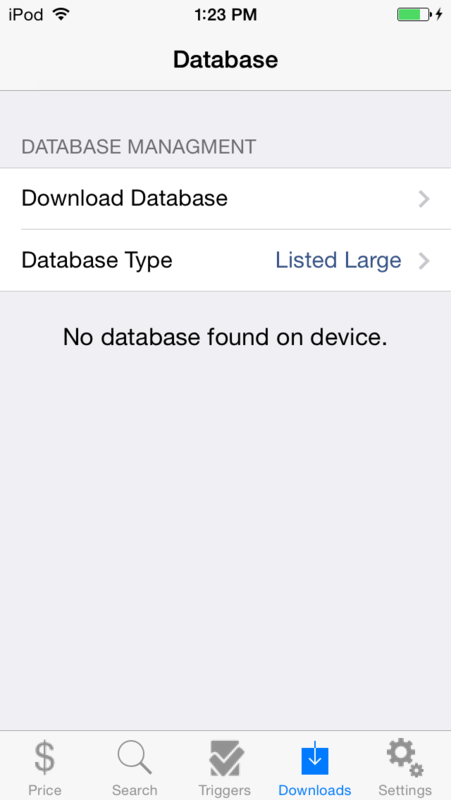 Once in Settings you should see Database Type. 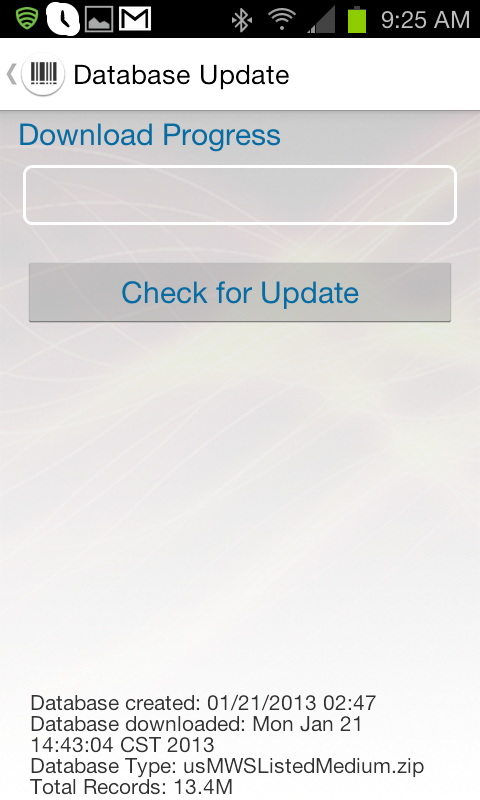 To download the database on the iOS version of Neatopricer using your iPod or iPhone, you need open the application from the application tray and go to "Downloads" on the bottom menu bar. 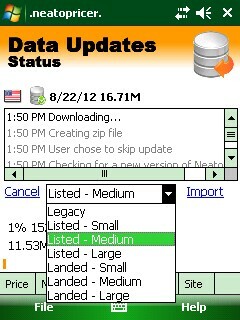 Then, hit "Update Database". Once you hit that you will see a prompt that will ask you if you want to update, hit "yes". The download will begin as pictured below and when finished will on the "Downloads" screen you'll be able to see what kind of database you have. To download the database on the Android version of Neatopricer using your device, you need to open the application from the application tray and hit the "Download" icon in the top right represented by the paper with the downwards arrow. Then, hit "Check for Update". 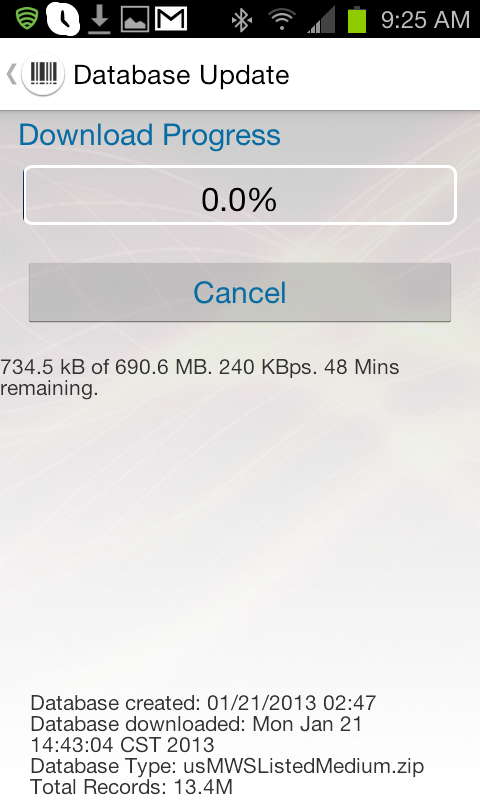 Once you hit that it will begin to download your database. 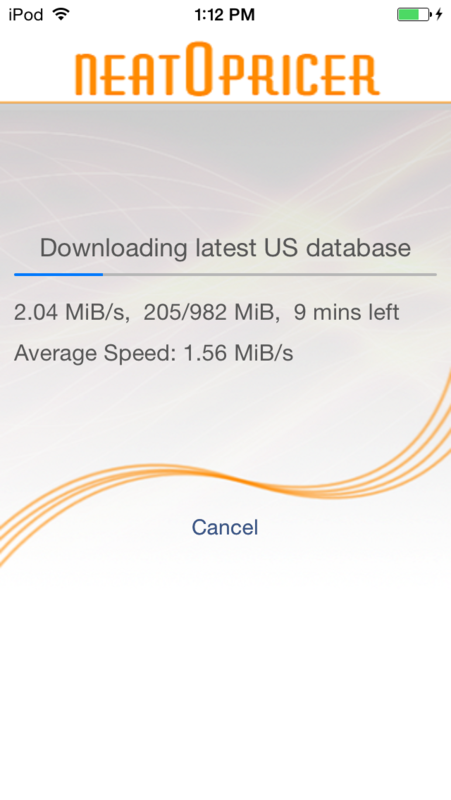 Once complete, you will see on the bottom details about your download like when you downloaded and what kind of database you downloaded. 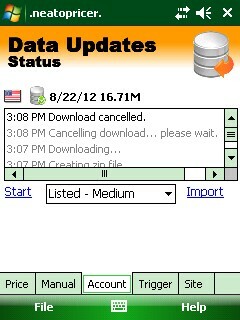 Updating has been simplified to make it a quicker and easier process. All you need to do is connect your PDA to the internet via your computer through Windows Mobile Device Center or ActiveSync. Once connected you open Neatopricer on your PDA(Start>Programs>Neatopricer). Inside of Neatopricer you will see tabs on the bottom of the screen. Select the "Account" tab and hit the Start button. This will start the download. You can see in the example below what it will look like. 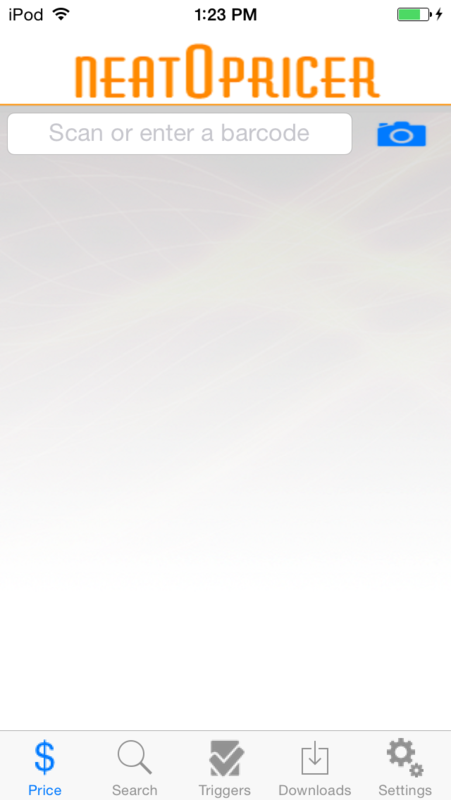 Note: If you receive the following error, "Can't find PInvoke DLL 'dl.dll'. ", then go to File>Settings>Data tab and check the box "Do not use native DLL".